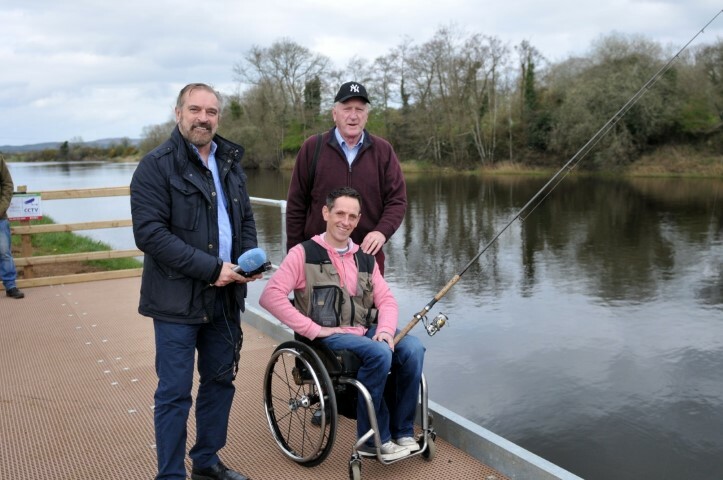 The opening of the East Mayo Anglers Association disabled Anglers Facility on the River Moy, took place on Friday 29th March. The initial concept for this facility was spawned as far back as 2007. The Committee of the time showed great foresight and vision in proposing such a facility. In 2011 when the present site at Crillaun Straide was selected, the plans were drawn and submitted to Mayo County Council by Coleman Doherty Architects Ballina. 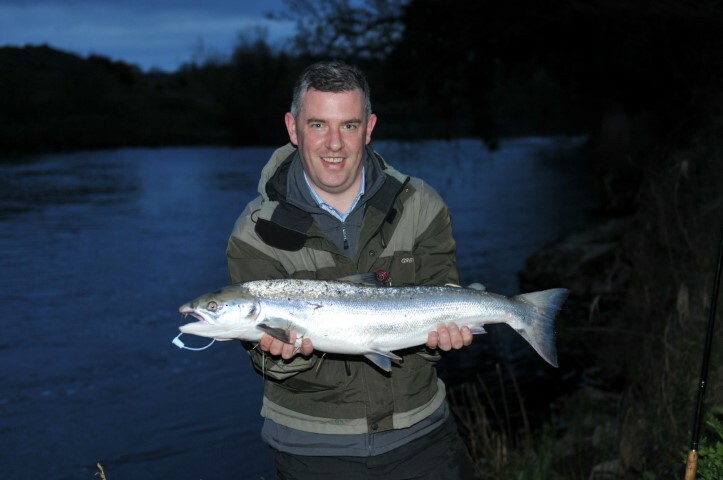 The initial planning was refused but after addressing the concerns of NPWS relation to the potential impact on the River Moy Special Area of Conservation, which is a priority habitat for a number of Species such as salmon, otter, and lamprey, a re-designed planning application was submitted, along with revised environmental screening reports and In September 2012 the facility was granted planning permission by Mayo County Council. Application was made to Leader for funding but for a variety of reasons was unsuccessful. 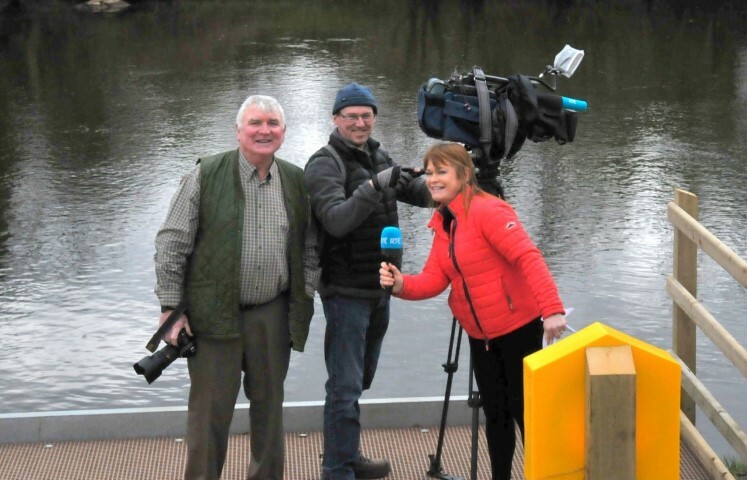 An application was then made to Inland Fisheries Ireland and in 2017 they very kindly agreed to back the project and cover 90% of the construction costs, with a grant of €154,000 subject to the condition that toilet facilities would be provided. The provision of toilet facilities was a major stumbling block as the facility had no planning permission for toilets. With the help of Liam Gavin IFI a compromise was reached and it was agreed to allow the construction go ahead on the understanding that toilet facilities would be provided as phase two of the project. 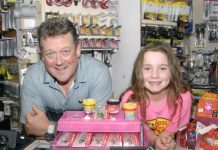 Lally Engineers Tourmakeady was appointed to oversee the construction and Hallquar Construction, Enniscrone was hired to carry out the work. On 27th August 2018 the machines moved in and the work finally started. The original plans were updated and it was decided to drill piles and anchor the concrete base to steel girders sunk deep into the river bank. The construction continued without any problems and it was completed on time and within the budget, in January 2019. 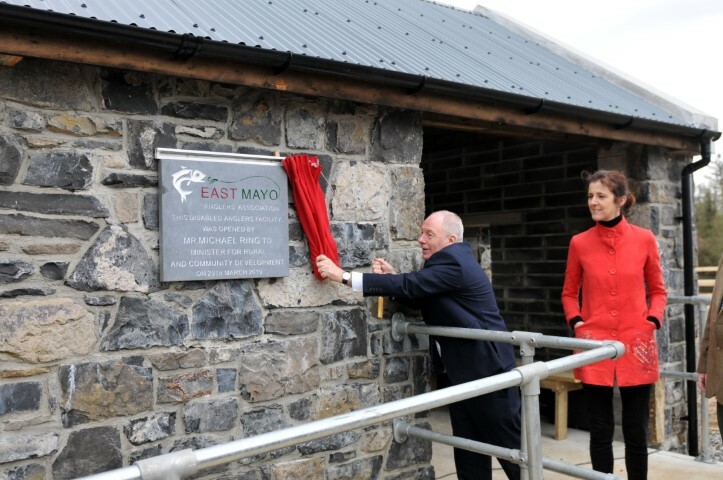 East Mayo Angler’s Association are very proud of the result, we have a €200,000 Disabled Angler’s Facility with a 76 meter fishing platform, a changing room and car-park which caters for wheelchair users, on one of the best pools of the famous River Moy. We have received very positive feedback from the Irish Wheelchair Association, Mayo County Council and anyone who has visited the facility. 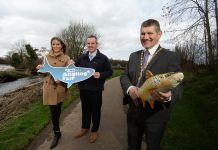 At the official opening and blessing ceremony, Father John Cunningham and Rev Andrea Wills conducted the blessing; prayers were said for a safe angling season by our local and visiting anglers. Prayers were also said for all the deceased members of the East Mayo Anglers Association. Mr. Michael Ring Minister for Rural and Community development performed the opening with Lisa Chambers TD, Matt Carthy MEP. Senators; Rose Conway Walsh and Michelle Mulhern and several County Councilors in attendance. 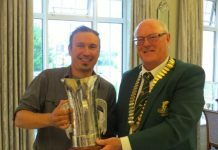 The ‘Conor Walsh Memorial Cup’ was presented by Ms Marie Walsh (Mother of the late Conor Walsh) to Bob Mayne the captor of the first salmon of the 2019 season, on EMAA club waters.